Chicago-based artist, Amy Honchell, has been commissioned to create a site-specific installation as a part of the MCA's partnership with Lollapalooza 2008. In Honchell's work, topology, sewing, and elements of mapping explore the parallels between the structures and functions of the human body, architecture, and the landscape. 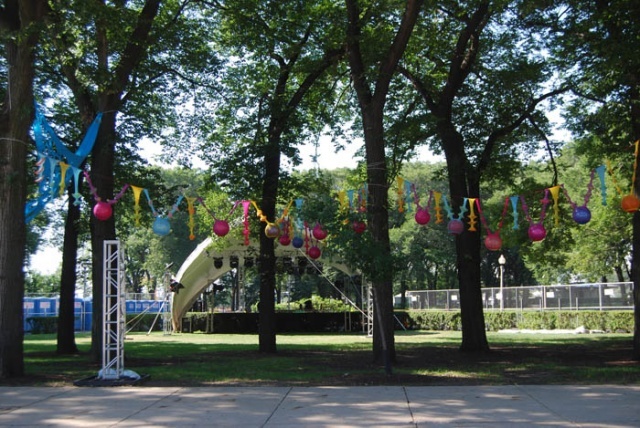 Inspired by an outcropping of trees and the electronica sound stage located at the corner of Jackson Boulevard and Lake Shore Drive, the installation will playfully engage concert attendees of the outdoor music venue. Honchell's piece will be on view from August 1-3, 2008. This exhibition is organized by Pamela Alper Associate Curator Julie Rodrigues Widholm.